THE INSTANTLY RECOGNIZABLE work of Alma W. Thomas (1891-1978) graces the Old Family Dining Room at the White House. In February, First Lady Michelle Obama revealed the newly refurbished space where Thomas’s “Resurrection” is displayed on the north wall. The painting is the first artwork by an African American woman to hang in the public spaces of the White House and enter the permanent collection. The renovation marked the debut of the Old Family Dining Room on the official White House tour, providing public access to see Thomas’s painting along with works by Josef Albers and Robert Rauschenberg that are also on display in the room. Adjacent to the State Dining Room, the relatively small Old Family Dining is used for official meals—intimate formal gatherings and working lunches with foreign leaders. The White House recently released a photo of a Passover Seder held in the room that drew renewed attention to the Thomas painting. Celebrated for her dexterous use of color, Thomas is most closely identified with her abstracts composed of poetic, ordered patterns of dabs and daubs. Emphasizing primary colors, “Resurrection,” a 1966 acrylic and graphite on canvas, is an example of her vibrant, concentric circle paintings. According the Washington Post, “Resurrection,” was purchased last year from a New York gallery for $290,000 with funds from the White House Historical Association. The Obamas have previously borrowed Thomas works from museums in 2009. “Sky Light” (1973) is in their private residence, and “Watusi (Hard Edge)” (1963) was intended for the first lady’s East Wing office, but the painting did not work size-wise in the space, so it was returned to the Hirshhorn Museum. IT’S FITTING THAT THOMAS’S WORK has entered the White House Collection in Washington, D.C. Born in Columbus, Ga., Thomas spent almost her entire life in the nation’s capital. She moved to Washington with her family as a teenager and went on to be the first graduate of the art department at Howard University in 1924. A devoted educator, she taught art at nearby Shaw Junior High School for 35 years, earning a master of arts degree in education along the way from Columbia University. In 1943, she helped found the Barnett Aden Gallery. Thomas was in her late 60s before she dedicated herself to painting full time. Although her early works were representational, she pursued abstraction with abandon in the 1960s and 70s. 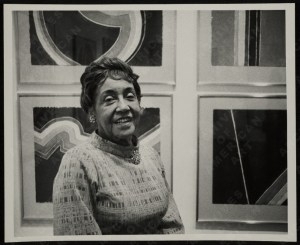 In 1972, Thomas was the first African American woman to have a solo show at the Whitney Museum of American Art in New York (at left), and later that year an exhibition of her work was mounted at the Corcoran Gallery of Art in Washington. The groundbreaking artist is enjoying a renaissance of sorts. Last fall, Hemphill Fine Arts in Washington, D.C., presented “Alma Thomas: Thirteen Studies for Paintings.” The exhibition featured a circa 1966 study for “Resurrection,” an untitled acrylic executed on multiple sheets of paper. In addition to the White House honor, more than 40 of her paintings and watercolors are currently on view in “Moving Heaven & Earth, Paintings and Works on Paper, 1958-1978,” at Michael Rosenfeld Gallery in New York through May 16.